If a mandolin has intonation problems, it is impossible to play the instrument in tune. Some parts of the fretboard may be in tune while other parts of the fretboard are not. Setting the intonation on the mandolin is a relatively easy procedure because mandolins use floating bridges, which are not secured or screwed to an instrument. It is held in place by the tension of the strings. The standard tuning for a mandolin is G-D-A-E, going from the low strings to the high strings. The strings are tuned in pairs, there are two G strings, two D strings and so forth. Tune the E strings to pitch with an electronic tuner. Leave the other strings loose until the bridge is adjusted. The bridge is difficult to adjust when all the strings are tuned to pitch because the tension of the strings holds the bridge in place. Fret one of the E strings at the 12th fret and pluck the string. Check the tuning with the electronic tuner to make sure it is perfectly in tune. Play the 12th fret harmonic for the same string. Place your finger over the fret, but don't press the string down to the fretboard. Pluck the string with your right hand to produce the harmonic. The harmonic sounds like a chime. Check the harmonic with the tuner. The fretted note and the harmonic should register exactly the same on the tuner. If the harmonic is flat, push the bridge slightly forward toward the neck. If the harmonic is sharp, push the bridge slightly backward toward the tailpiece. Tune the G strings to pitch with the electric tuner. Compare the fretted 12th fret G with its harmonic. Adjust the bridge until the fretted note and harmonic register exactly the same on the electronic tuner. Tune the D and A strings to pitch with the electronic tuner. Play a few chords on the mandolin for a few minutes. Re-check the tuning with the electronic tuner. 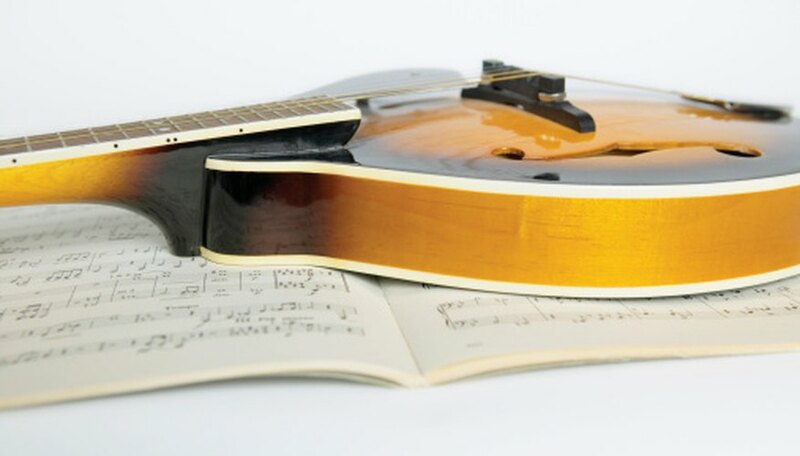 A variety of electronic tuners are available for acoustic instruments like the mandolin. The tuners that clip onto the headstock are very accurate and easy to use. They display the letter for the string that you are tuning and use arrows that indicate if the string is flat or sharp.